Renting a bicycle is a very popular and a great way to explore the Outer Banks on a vehicle powered by you! Also, check our our stand-up paddle boards as a great option for your vacation. If an eco-friendly electric vehicle is what you want, we have you covered. Change your perspective as you ride in a golf cart or GEM car around the Outer Banks. Golf carts are fun for the whole family! Renting a scooter or scoot coupe will let you move a bit faster around the Outer Banks? Our scooters and scoot coupes are sure to please! They are good vehicle options for one or two people. Scoot coupes are great fun for the kids! It’s an economical way for the entire family to have fun all afternoon. 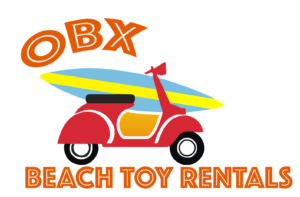 At OBX Beach Toy Rentals we specialize in a wide variety of fun rentals to get your Outer Banks vacation moving! From rental bicycles to golf carts rentals in the Outer Banks anything in between, we have you covered. All of our rental fleet has been specially selected to ensure you will enjoy the ride! We have a wide variety of options available for your rental selection. If you are confused, just ask us. We are always available to answer any question, and help you choose the best option based on your vacation fun requirements. We have two store locations in the Outer Banks for you to pick-up your bicycle, scooter, scoot coupe, SUP, golf cart (Corolla only) or GEM car (Nags Head only). Our Nags Head rental shop is located at 7128 S. Virginia Dare Trail Rd., just north of Jennette’s Pier, across from the Gray Eagle public beach access and in the Dare Building. Our Corolla rental shop is at 821 Ocean Trail, in the stand alone building on the north end of the Food Lion parking lot. Explore our rental options below and reserve online to come pick up in one of our Outer Banks stores. We offer delivery for many of our products, with some location restrictions across the Outer Banks. Check out our delivery options and feel free to give us a call with any questions.